Plan includes a total of 2500 units, each unit can be used for any combination of Talk/Text/Data. Works with T-Mobile phones or AT&T Unlocked phones or any compatible GSM devices. You can keep (rollover) your remaining balance if you refill your account before the current plan expires. If you do not refill before the expiration date, your remaining balance will be removed from your account. We rollover for 6 refill balances, any previous balance will be removed. Use your own device - Activate any T-Mobile phone, AT&T unlocked phone, Apple iPhone, Android, Windows or other compatible tablets. Ready to use. Activation Code included. 1 Year Prepaid Rollover Plan. 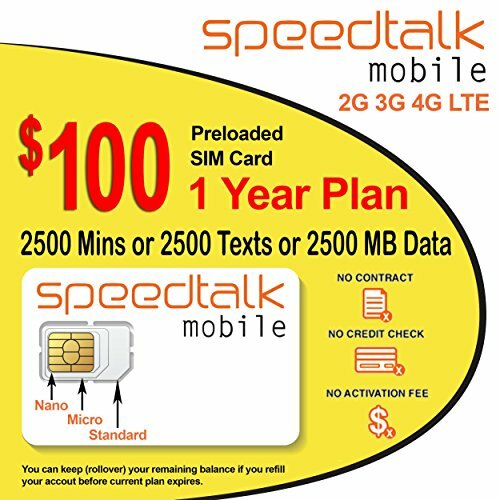 Any combination of 2500 Minutes Talk or 2500 Texts or 2500 MB 2G 3G 4G LTE Data. Tri-Punch SIM cards. Standard, micro and nano size all in 1 SIM card.